The thing about applying topical products is the uncertainty that it can be absorbed by your skin effectively. This I’ve come to realize ever since I started my commitment to take care of my skin. Out of all the products available in the market, how would you know which one to try and how would you know which one will work? These has been my questions when I first started on my skin care regimen. As a woman who’s about to enter her 30s (I’m still in denial about this), investing on skin care is one of the best decisions I’ve made. Gone are they days when I can live with soap and water alone as my beauty regimen. To further know what works for my skin, I am still constantly searching for more products to add to my beauty arsenal- lucky for me, I’ve got two! I’ve been mum about these NFF (new found faves) for some time now, secretly wishing I can already talk about it the moment I got first dibs a month ago. And today, they’re finally available here in Manila. Yahooooo! There’s a new beauty duo in town that’s bound to blow you away and I got introduced to them during my trip to Singapore last March. I was super excited to reveal this #MiracleDuo because I’ve experienced firsthand how powerful and effective they are. Ladies, meet Olay Regenerist Miracle Boost Youth Pre-Essence and Olay Regenerist Micro-sculpting Cream. The #MiracleDuo when used together give you 2x key active penetration into epidermis, giving you skin that looks up to 10 years younger. 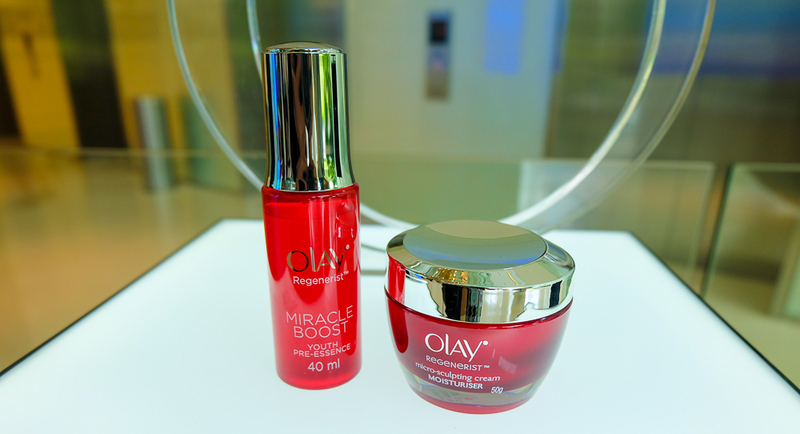 What impressed me the most about Olay Regenerist Miracle Boost Youth Pre-Essence and Olay Regenerist Micro-sculpting Cream is that these products are backed by science. Olay scientists around the world use the latest tools and partner with leading experts to develop the best skin care solutions. Over 10 years of research and over 55,000 hours of clinical testing. I’ve witnessed the technology firsthand as I had the privilege to visit P&G’s Innovation Center in Singapore. I can’t wait to share you what happened and what I learned during my visit on a separate post. So one of the studies they had, Olay discovered that women’s skin looks dull, fatigued, and dehydrated as it ages. 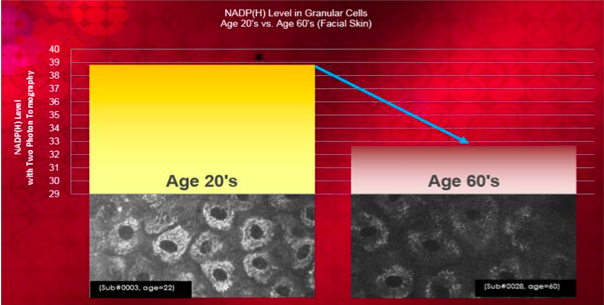 Skin Cell Energy, as measured by level enzyme of NADP (H) in cells, is high among young people, but, as women get older, Skin Cell Energy declines. Skin Cell Energy allows skin to produce and maintain radiance, firmness and hydration. It affects skin’s ability to fight signs of skin ageing and its ability to absorb anti-agening treatments. Despite this happening on a cellular level, women feel this change. Pre-essecne is the latest trend in Asian Skin Care for younger-looking skin. 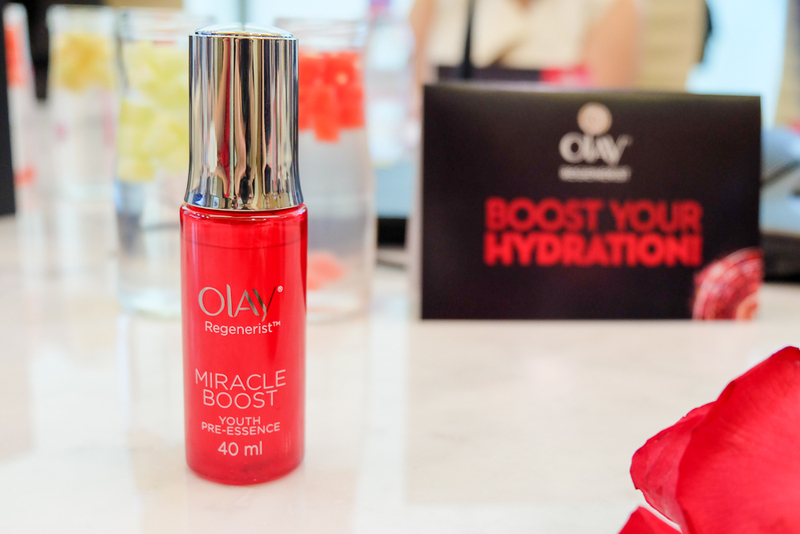 Olay Regenerist Miracle Boost Pre-essence addresses your skin care bottleneck (on a cellular level) and jump-start your skincare regimen anew. The first drop of this Pre-essence starts regeneration of a million cells and is proven to boost surface cell metabolism to levels comparable to younger skin. Me likey! I’ve never really encountered a skin care product that can actually penetrate from within as much as the Pre-essence. The Golden Amino Peptide [pal-KTTKS] (the not-so-sceret-ingredient) of Miracle Boost Pre-Essence makes it possible (and actually promises) to boost cell energy by 35% to strengthen skin’s inherent young power and trigger self-collagen production for bouncy, younger looking skin. During my visit at the P&G Innovation Center in Singapore, I learned that I already have premature signs of skin ageing. What a sad truth and I’m not even in my 30s yet! This is enough reason for me to try the #MircaleDuo because it works at the cellular level of my skin, helping in its regeneration. It’s literally helping my skin glow from within. The Pre-Essence serves as an immediate next step after cleansing and toning one’s skin. It also helps absorb other products you use as part of your skin care regimen. If you’re a fan of face creams and would want to achieve younger looking skin, then go for the Pre-Essence. You can use it with your existing cremes (such as Olay Total Effects). But of course it’s best to use the #MiracleDuo together to achieve good results, use twice a day- morning and night time for at least a week and you’ll notice how it can give you supple, smoother and more hydrated skin. I’m now a Pre-Essence kinda girl! I make sure I apply it daily to give me the #MiracleBoost my skin needs. I got pretty paranoid after taking the skin test at the P&G Singapore Innovation Center, so I make sure not to miss even a day of Pre-Essence. I know we cannot stop ourselves from ageing but with the #MiracleDuo, we can achieve a healthier and younger looking skin. Thanks again Olay Philippines for letting me get first dibs on this wonderful #MircaleDuo. Where can I find the “Daylong sunblock daily”? Are there small packaging for the miracle duo? Would like to try it first. Is Pre-Essence applicable to men? Hi ms. Jackie , iam a product of olay for 3 years and I only use the olay regenerist serum. Im 30 years of age. I just want to know What is a the applicable moisturizer for the day long sunblock? Can I combine to use the moisyurizer and regenerist serum? Hi Jenelyn, best to use the Olay Regenerist Micro-sculpting cream with the Olay Pre-essence serum. Apply the serum first and let it dry before applying the micro-sculpting cream/moisturizer of your choice. As for the Daylong sunblock, you can use any moisturizer that you’re already used to. If you plan on trying new moisturisers and facial cream, try one product at a time so you can test if it has no adverse effect on you and your skin. I hope this helps. Good luck on your skincare journey! I’ll try d product. May be it really give a person 10 yrs younger. Tnx! just want to know..what is the best cream i can use for my freckle face..
i am very much interested to try these products and see the results. Just one question, Is Jackie a real person? I believe the person talking about these products is KC Concepcion who is credible to be your model look wise and talent wise. I am a real person and this is my blog. To clarify, I am not Olay’s model. I simply wrote about my firsthand experience learning about Olay Regenerist Miracle Duo during my visit to P&G Singapore Innovation Center. Thanks. HI Jackie, I am 24, and also an Olay user. I am using the Olay Regenerist Microsculpting Serum for my face and the Eye Serum that comes from the same line. I have problems with my pores though. They are open, some are clogged, which makes me prone to black heads and white heads. I am currently researching for products that can help with this. Do you have any suggestions? I’m fond of using oil of olay in the 80s, It was great having a smooth and cool skin then. But what i liked most was the scent, a kid had said “You smell like a baby”. Does the product still exist, I can’t find one today. Hi Bayani! Ooooh, Oil of Olay was so popular in the 80s! I believe my mom had that too before. I don’t know if it’s still available though, perhaps its discontinued.